Batman: Assault On Arkham DVD review . This animated movie is set in the Arkham videogame universe during the five year gap between Arkham Origins and Arkham Asylum , but aside from the name the two share little DNA. There’s no consistency in character design, for example; Amanda Waller seems to have put on several hundred pounds since her cameo in Origins . The games take themselves fairly seriously, but the tone here is bewilderingly erratic – brutal violence sits uneasily alongside Saturday-morning slapstick and annoying dubstep-laden montages. The story gets off to a dismal start. It focuses on the Suicide Squad, tasked with breaking into Arkham and retrieving information from The Riddler. Deadshot and Harley Quinn aside they’re all d-listers. It’s predictably plotted, the action sequences frequently descend into an incomprehensible flurry of fists and feet, and the broad humour rarely hits the mark. The story finally picks up 40 minutes in, when The Joker shows his face. He’s Assault ’s secret weapon, ably performed by Origins voice actor Troy Baker. Kevin Conroy’s Batman feels like a guest star in his own movie, though. Given all the excellent work developers Rocksteady have done in creating the Arkham universe it’s disappointing to see it short changed on screen. 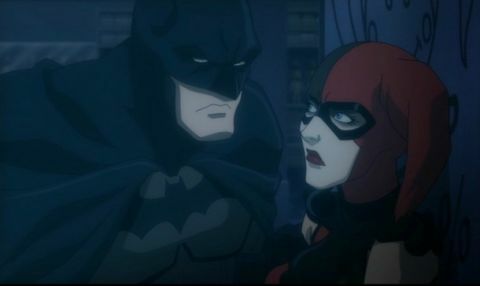 A featurette about Harley Quinn (13 minutes), a preview of animated movie Justice League: Throne Of Atlantis , and bonus episodes of Justice League Unlimited and Young Justice .